We are pleased to announce the dispatch of two “Helicopter Underwater Escape Training Simulators” (HUET) to our customers in India. HUET “Valliant” is a 4 seater model, HUET “Vulcan” is a 6 seater. 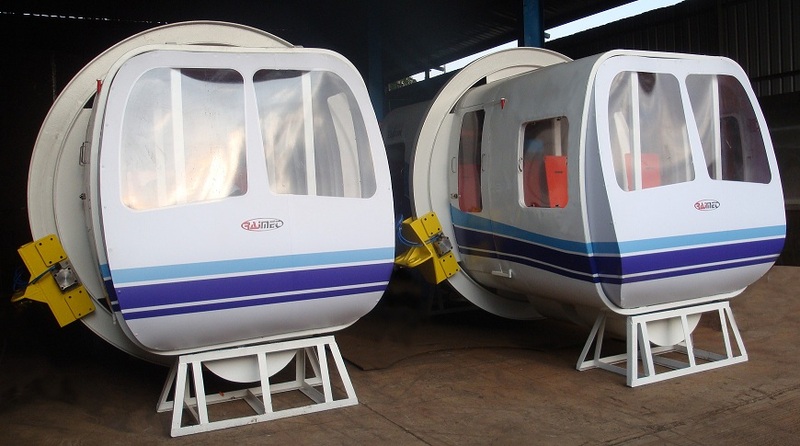 Both have pneumatic braking systems, integral buoyancy tanks, hinged+ jettisionable exits, unique pushout windows & seat belts with emergency release systems. The HUETs are designed to meet OPITO standards & are manufactured to RajMet’s technical specifications & quality standards. Computer aided Design and Analysis ensure safety & reliability over the HUETs working life. “HUET” is provided to helicopter flight crews, offshore oil and gas industry personnel and military & law enforcement personnel who are frequently transported by helicopters over water. The purpose is to prepare them for emergency exit in the event of crash landing in water. The training involves submerging the HUET Simulator in a pool and rotating it upside down. While underwater in an inverted position, the delegates are trained to brace for impact, identify primary and secondary exit points, unfasten the seat belt, push-out the specially designed window & escape to the water surface. Crude oil futures posted strong gains Monday amid a development on the US-Iran oil sanctions front. Here's a five-point breakdown of what happened, the impacts and what's next. Zhejiang Energy and Sinopec are building an LNG import terminal at Wenzhou in eastern China. A unit of Kuwait Petroleum Corp. has awarded McDermott a technology contract tied to a major project in Al Zour, Kuwait. The deal marks a further push by the Italian company into the Middle East. Six months after the U.S. rocked oil markets by letting Iranian exports continue, its decision to end sanctions waivers that allowed shipments is also set to reverberate across the globe. Aberdeen-based Archer Knight has completed a $649,505 equity raise. Regina Mayor, global sector head of energy and natural resources for KPMG, gives her view on the Permian. Oil rose to the highest level in almost six months as the U.S. government was said to eliminate sanction waivers that allowed buyers to import Iranian crude.